At first, they were beautiful tiles framed by light, barely noticeable grout. Now, years later, your tiles show visible signs of bacteria build up and your grout has started to turn an awful, darker version of its original color. If this is the case, consider calling in the tile and grout cleaning experts at UCM Cleaning Services. No matter how clean your tiles are if the grout surrounding them is dirty, it affects the appearance of the whole room. 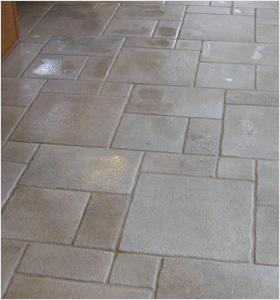 Our grout cleaning service experts clean your grout using the most advanced pH neutral cleaning agents. Many are of the mistaken belief that cleaning agents with acid help with grout cleaning. This is a big mistake, as acid can eat away your grout and eventually cause you to replace the grouting and possibly even the tiles. Tiles and grout need cleaning in your kitchen, your bathroom, your laundry room, and sometimes even in outside settings, like porches and sunrooms. The hours you would have to spend to clean all those grout lines plus the actual tile will do a number on your back and on your patience. Avoid the trouble and have a professional do it. Your back will thank you! It is very important to be aware of what cleaning agents are suitable for your grout and ceramic tiles, Philadelphia Carpet Cleaning uses ph neutral agents together with sapless detergents, which actually provides a heavy duty clean. We finish off with a couple of thorough rinses. This is not out of potential health hazards, this is to ensure that any residue has been removed.